So are the double/triple negatives meant for emphasis rather than cancelling each other out? Neither - there's no reason behind it, it's just how a negative sentence works in Bulgarian. For Bill: Никога не съм казвала никакви лъжи на никого. In my language you must use negatives in every place they can be used. For example: I haven't never told no lies to nobody. If you use "ever" or "anybody" instead of "never" and "nobody", it would make no sense to the native ear. I've heard similar constructs in rural American English: "I ain't never told no lies to nobody." What about "You ain't seen nuthin' yet"? Or "I can't get no satisfaction". I had posted this elsewhere because it's driving me crazy, but I thought I should bring it up in the appropriate thread, too. Last edited by canismajoris; April 4th, 2013 at 8:08 pm. I can't help at all, because I haven't parsed sentences for about 30 years, but I'd question whether it is an interrogative statement. It depends on the context. If it's part of a longer sentence e.g. In the last days, Loki will give birth to a giant wolf, who will eat the Milky Way", then surely it's a straightforward relative clause? That's a fine point, but in this case it's interrogative because I say it is. Yeah, in looking at it, I was wonder whether it was a sentence with a question mark at the end (in which case, it is interrogative, but not a clause) or whether it was a relative clause, as Mel pointed out. I always tuned out during sentence diagramming in grade school and haven't had to do it since (so I can't help with the diagramming), but I do have an interest in learning it... now. I suppose it could be the main clause of a longer question, e.g. "Who will eat the Milky Way* if I eat the Snickers*?" 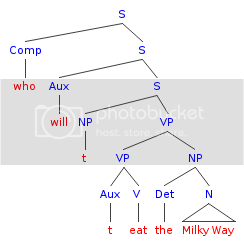 e.g.2 "Who will eat the Milky Way* that the cat licked?" Last edited by Melaszka; April 7th, 2013 at 2:54 pm. We have them in the U.S.
As has been pointed out, it depends on the punctuation. Is it a complete sentence, with a question mark at the end? Or is it a clause within a bigger sentence? We didn't parse sentences in school, but I had a private tutor who believed in it. Personally, I hated it, and couldn't see the point, since I already knew how to construct a sentence in English. Personally, I always hated learning grammatical terms, and that's why I never wanted to become an English teacher even though most English speaking immigrants to Israel of my generation were offered retraining as English teachers. Well I'm not sure parsing sentences in school is really quite the same thing, to be fair to any linguists out there. Attempting to understand the structure of a language is not only a matter of describing any one sentence, but of ascertaining rules about the language that can produce any grammatical sentence native speakers could think of, and every one they couldn't. Now that's not what I was doing, as I'm only a mere beginner where syntax is concerned, but I feel linguistics deserves much more respect as a scientific discipline than being compared to rote memorization of grammatical terms. I didn't like it very much at school either, but I found it really useful when I had to study other languages (specially Latin). Later I have been a tutor in English and I've found it very hard to teach the structure of a foreign language to people who didn't know the structure of their own. Specially because you English speakers have quite a definite structure (your adjectives always go before the noun and so) while we Spanish are quite free about where to place our words. I didn't like it very much at school either, but I found it really useful when I had to study other languages (specially Latin). Later I have been a tutor in English and I've found it very hard to teach the structure of a foreign language to people who didn't know the structure of their own. The applicability of cross-linguistics education is the most important thing I've learned by studying linguistics over the past few years, exactly. It has always been a pet ambition of mine to teach foreign languages to primary school children, just to start the ball rolling early. I don't speak any languages but English, but I'm confident in saying I wouldn't need to in this particular case. It's my belief that everyone is a linguistic genius, they just don't know why or how. Much in the same way a professional football player may be uniquely accomplished at taking a corner kick, but most likely can't explain how he or she arrives upon the ideal the ballistic trajectory of the ball, accounts for air friction and gravity, or fully understands whether and in what way the choice of shoes matters. So what I care most about is taking these people who've always had plenty of success in, you know, doing language, and showing them how remarkable it is that anyone can do it at all. Specially because you English speakers have quite a definite structure (your adjectives always go before the noun and so) while we Spanish are quite free about where to place our words. We do now, certainly. Back in the day, by which I mean the years 500 to 1400 CE, things were a little more awesomely weird. English was then (well in the earlier part of that range) a much more inflected language, if you look at noun morphology. Our medieval forebears had four or five noun cases (there was an instrumental that seems to have merged with the dative--I blame the "Danes"), and so there was a pretty modest excess of scrambling going on. Indeed, for Modern English speakers, learning to live with a free word order is the chief obstacle to learning older forms of English. Last edited by canismajoris; March 2nd, 2014 at 2:20 am.